Successfully Added Car DVD Player for Volkswagen "Road Emperor" - 2-DIN, 3G Internet, WIFI, GPS, ATSC to your Shopping Cart. 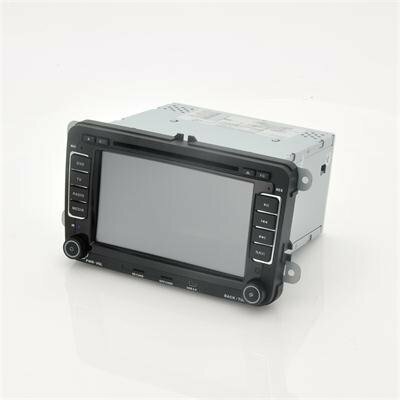 Car DVD Player designed for the Passat B6, Passat B7, Passat CC, Jetta 2005-2008, Golf 2003-2009, Skoda Superb, Tiguan and Touran. Turn your Volkswagen into a driving entertainment center. Access the internet wirelessly with the “Emperor’s” Wi-Fi connection or 3G network and browse your car trip away, listening to internet radio. The big 7 Inch touchscreen, offers ultimate viewing pleasure of all your movies, pictures and more. Cruise to your destination with peace of mind, knowing that the built-in GPS will safely guide you, wherever you go. The Telechips tcc8900 CPU is made by the Korean tech giant Telechips, a leading microprocessor maker for automotive multimedia units and the tcc8900 is their brilliant brainchild. The tcc8900 houses a 500MHz ARM11 core and a separate ARM Mali 200MHz graphic processing unit. And like all great technologies, synergy dictates that the whole is far more than the sum of its parts. A dedicated GPU allows picture in picture graphics to soar and 1080p videos to scream such that 500MHz plus 200MHz definitely add up to more than 700MHz, which is especially useful when you're running top of the line GPS software or watching streaming discreet entertainment in the privacy of your automobile. They say the type of car you drive speaks volumes about the type of person you are. To that end we'd like to suggest that the type of in-car system you install in that said same car could very well determine your destiny. Are you simply content with basic living or do you want it all? If you answered the former then jolly good. There's nothing wrong with lack of ambition. The world still does require waiters and doormen in droves. But. If you aspire for more from life, from yourself, from your car, then The Volkswagen Emperor replete with 3G and WIFI internet, ATSC receiver, advanced GPS functionality, a truly superior media player, and so much more was designed especially for you. Brought to you by the leader in wholesale Car DVD Player, the “Emperor” is now in stock and offered at a competitive wholesale price. Order one today and we guarantee to ship it out tomorrow. Offered with a 12 month warranty, quality is assured! This Car DVD is compatible with the following 3G Dongles: Huawei E261, E1780, E176, E180, E181, E153, E870, and E173. When using 3G Dongle, please input "3gnet" and *99# on the third and fourth line in 3G network settings. Se le puede conectar el telefono para hacer de manos libres.